I’m not married, but I have been in several relationships in my time. One of which, I am currently in, and has lasted about 4 times as long as Kim’s marriage. This being said, I feel I have a bit of the upper hand here. Relationships take work. They take time, they take discussion. I live hundreds of miles away from my boyfriend, but we make it work, because we communicate and we care about each other. Marriage is no different, Kim. If you were serious about your marriage to Kris, you would have talked to him, gone to counseling, taken that time off from work to spend time with him. Rather than ending it (and letting him find out from the media, not you) you should have tried a bit harder to work for it. No one is taking his marriage seriously, let alone this divorce, simply because of the mere fact that its obvious Kim didn’t try. The wedding brought in several millions of dollars for Karshian/Humphries. It was aired on E! and built up as much, if not more, than the Royal Wedding (now, I’m sure THAT is a marriage that is difficult to make work, but they’re certainly doing it.). It became clear through the commercialization of the wedding, and the episode itself, that it was more about making the money, drawing in the crowds and the media drones, rather than the holy union it was meant to create. Also, it’s not about the ring. 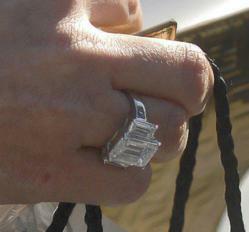 So many stories have swirled about Kim keeping the $2M, 20 carat ring Kris (“supposedly,” read on for more info!) gave her when he proposed. Honestly, if you had a marriage that lasted 72 days, would you really want a ring (especially one of that stature) representing its failure? Kourtney has made her difficult-long-term relationship with Scott Disick work in the worst of circumstances and situations. Scott goes to therapy regularly to keep himself in check (for reasons that go beyond the purpose of this article), and Kourtney has been known to attend these sessions as well. Why? Because they’re committed to making it work, and they know it won’t be easy. Khloe is also in a situation very similar, almost identical, to where Kim was. She married LA Lakers player Lamar Odom after only knowing him for just over a week. Yes, a week. Not only has their marriage managed to hold up, but she continually seems happier and happier. Her husband is also a traveling NBA player, while Khloe is also an over-worked Kardashian. They make it work, they knew each other for a less amount of time. I think Kim would have had the perfect person to go to for advice on this one. If you really cared him enough to, you know, marry the guy, and really intended to spend the rest of your life with him, then you think you would have had the heart to inform him (and his family) of the divorce before the media ran with it. Or even before filing for it, perhaps. TMZ reported that Kim sent an e-mail to her “extended family members” making them aware that she was filing for divorce, apologized, and explained her embarrassment. There are so many things wrong with this that I do not know where to begin. 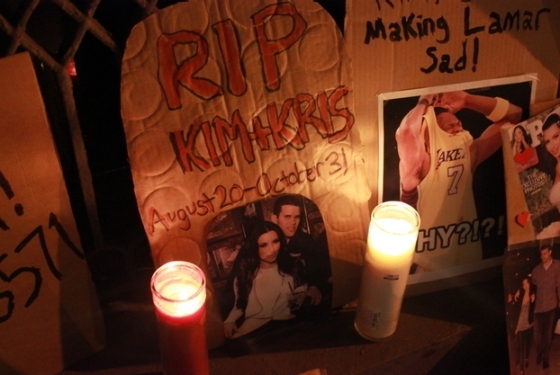 First, if she had the time to e-mail her family, a phone call to Kris would have been nice, too. Second, this quote was part of the e-mail, “I would rather you hear it from me than someone else or the news.” What about Kris? Third, another part of the e-mail stated, “I’ve spent the last few months struggling with my marriage.” The last few months? You were only married a few months! Fourth, “Kris is a great guy but we come from such different worlds and he isn’t what I thought when we 1st met.” Don’t you think you would have realized this before being married? Just a thought. Fifth, she states that she is embarrassed for bringing everyone along for the ride and having the lavish wedding. All I have to say is, you should be embarrassed. The New York Post reported that Kim’s publicist from 2007 to 2009 believes this wedding was completely staged. He explains that while he was representing her they staged something similar, to make the press believe then-boyfriend, Reggie Bush, was going to propose. This was also the time,previous publicist Jonathon Jaxon says, that Kim bought the infamous ring (the one Kris gave to Kim) as a gift to herself. Jaxon, said “She knew weeks before getting married she didn’t want to do it,” he alleges. “She’s never gotten over [ex Reggie Bush].” It’s obvious that this will never be answered. I don’t foresee Kim coming forward anytime soon to say yeah, it was staged, it never meant anything. But, when we look at the facts, is there really much to debate with that statement? Chances are, this Kardashian Kuandary won’t be going away anytime soon. Kris has been reported to be so committed to the marriage and making it work that he is refusing to sign the divorce documents… but, that’s all subject to change when the persuasive ways of the Kardashian’s are considered. If anything can be learned from this situation, perhaps it teaches young couples everywhere not to rush into anything. Take your time, get to know each other. WORK for your relationship if you’re truly dedicated to that person, and if you really love them, don’t let it go so easily. Do all that you can to make it work, because that’s what love is about. Business on the other hand, can easily be settled after a few million dollars are exchanged and some files go through court. But, again, I must say, I really love the Kardashians. I think they are entertainment and business entrepreneurial geniuses. They have made, established and built their own brand out of their own last name and ideas. I generally support them in all they do, all in the name of PR and promotion. But, I can’t help to feel a bit betrayed and ashamed of Kim on this one. What are your thoughts? Will Kim and the rest of the Kardashians outshine in the end? Is any PR good PR? Or will we just have to wait until the new season of Kourtney and Kim take New York (which premieres on E! on Nov. 27) to find out? I agree with you completely. 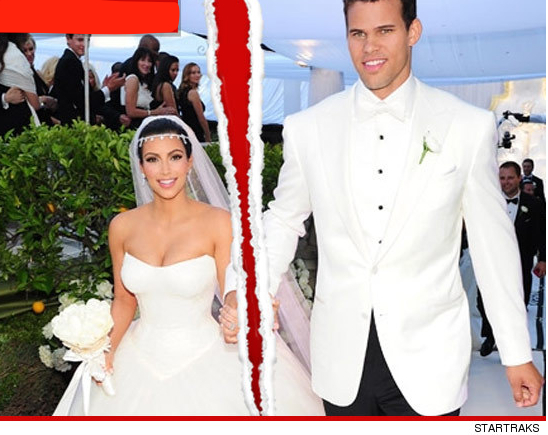 While I admire the Kardashians for their brilliance in the field, this “marriage” took it a little too far for me. I personally feel that the entire wedding was staged from the very beginning, and that makes me upset. I have been married for 7 years, so I feel like it was a slap in the face to the sanctity of marriage in general. I’m sure you know that Kim’s mother released a book the day after the divorce was announced? Fishy, Fishy! Now that the show is airing again, I feel that they are trying to get sympathy for Kim’s decision by portraying Kris in a negative light. Honestly, they are doing a good job making him look like a jerk.